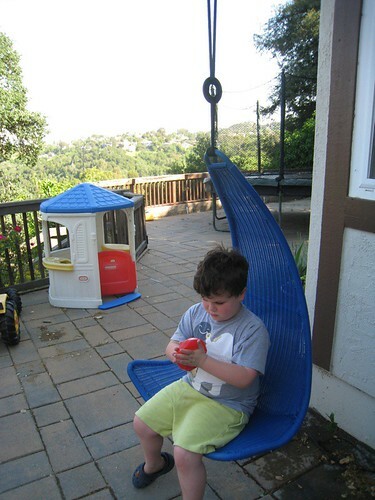 Jo Spanglemonkey gave us her extra IKEA swing chair more than two years ago. Last week we finally installed it. Another feature that makes our house a happier place for Leo and his sisters and encourages independent play, plus makes us more of a destination for friends and family: check! Wow now that's what I call a deck. Love the chair too of course but I have no idea where I would find to hang it. I have seen these before too but I don't have a patio cover so I thought I could not hang it outside. What did you hang it from, the eaves? I can just picture how happy he is with this!! Anything whole-body sensory = leelo paradise! @victoria it is hung from the underside of a second-story balcony. @Maddy I prefer a deck to a lawn, personally. Lawn maintenance is a pain, and thirsty thirsty lawns make no sense in mostly-parched California.